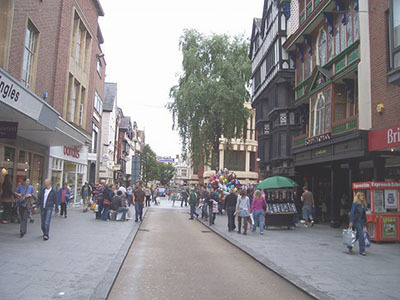 Exeter is the ancient county town and capital of Devon. A settlement existed on the River Exe long before the Romans made it their most westerly fortified castle. Nowadays it is one of the top ten most profitable locations for business in the country. Certainly an area for employment and a good place with a high quality lifestyle. The city is busy and lively, shopping caters for all from antiques to open air markets and everything in between. There are two theatres and a spirited night life. Beaches are not far away and the fertile red Devon countryside is just beyond the city. With all this it is a useful centre for touring Devon. A pleasant break on its own with plenty to do. The ancient shops and the modern ones. It is easy to get around and about Exeter and its environs, well worth the trouble!! Coaches, long distance buses and the local variety all use this busy bus station. There seems to be a bus to and from everywhere! Seriously this is an excellent facility - to and from Devon's county town to large numbers of places in the county. Buses to and from places in the adjoining counties of Dorset and Cornwall. Coaches to Airports and other places in the country. Try the buses with an X in the number. They are long distance buses with a local flavour. The X53 for instance runs from this city to Poole via Lyme Regis and Bridport. Runs along the coast linking the smaller places like Beer, Seaton, Abbotsbury, Burton Bradstock etc. The scenery is stunning from the top deck. Try it - all the pleasures of a trip and none of the driving hassles! Short of time, the best bit is to Weymouth! National Express coaches run to this coach station. The town has two mainline stations. Exeter Central which caters for the trains from and to Waterloo as well as some to Exmouth, Paignton and Barnstaple. St David's station is on the west side of the city and the larger of the two. It has services to Paddington as well as Waterloo. Added to that services to the Midlands, North England and Scotland. Nowadays an international airport with flights to and from some European destinations, the Channel Islands as well as domestic destinations. A popular airport it handles over a millon passengers. It started life as a small grass strip for a club in the thirties and became Exeter Airport in 1938. As RAF Exeter it played an important part in Fighter Command during the Battle of Britain. The airport was also used by the USAAF as a D Day transport base. Paratroops left the airport and were dropped near Carentan in Normandy. The city was a major player in the wool industry in the late 1600's. This is hardly surprising with the good farmland in the area. Quay House was built in 1680 and was a storehouse for the woollen cloth. That wool was then taken down the canal. Nowadays it is a tourist centre and transports its visitors to the city's past, present and future. Needless to say all the usual tourist information is available and there is a gift shop. Meeting place for the Red Coated Tours. One of those delightful little shops in Gandy Street. Shopperholic Alert This city is a Shopper's Paradise!! All the big stores plus lots of speciality and unique shops. The centre - Princesshay, High Street etc are an electrifying delight for the serious addict. For those of us not so addicted it is a pleasant retail therapy. Remember also to explore the little lanes like Gandy Street, they are gems and a delight, full of those little shops selling antiques, crystal, designer items and so on not found anywhere else. There are all types of accommodation available in the city. From bed and breakfast for the casual visitor, to luxury hotels, all are catered for. See the right hand column above for more information and links. There is certainly plenty to do!! Plenty of interesting places to visit!!! As this was built in 1330 it is said it is probably the oldest working municipal building in the country. Certainly it has seen history. If only its walls could talk they would tell of the reception of monarchs, executions outside, discussion of siege handling They saw Hanging Judge Jefferies preside over one of the “Bloody Azzizes” after the Monmouth Rebellion, mobs of the 1800's, and watched as the Blitz rained down. Now they watch as citizens and tourists enjoy their city. © Copyright Julian P Guffogg and licensed for reuse under this Creative Commons Licence. A majestic edifice set in the green lawns of Cathedral Close. 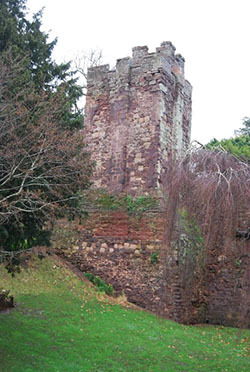 The seat of the Bishop of Devon and Cornwall was moved from the Cathedral at Crediton where St Boniface was born (Crediton Cathedral still exists) to the city in 1050. At first services were held at the Church of St Mary and St Peter. The Bishop really needed a new Cathedral and when William the Conqueror's nephew, William Warelwast, was appointed Bishop one was started. While its official foundation was in 1133 it took until about 1400 to complete. The design had been changed in 1258, although the two towers were kept and some of the Norman walls. That wonderful western facade is medieval and the vaulted ceiling is magnificent. Some of the Priory remains off Fore Street. Benedictine Monks built a monastary in 1087. There are cycling and walking paths alongside the river. © Copyright Andrew Tryon and licensed for reuse under this Creative Commons Licence. Nowadays it is a vibrant area with many interesting shops, bars, restaurants. A walk round the quay is a pleasant one. Take boat trips from the Quay, hire a canoe or a pedalo. Go fishing, but you will need a permit. 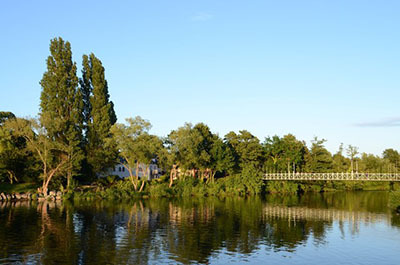 The Exe Cycle Route is a flat seven mile ride along the River Exe and Ship Canal. Goes through nature reserves. It is being extended further and will form part of the Sustrans National Cycle Network 2. There are only five floating bridges in the country and this city has one called Butts Ferry. Cross the river and see the quay from the other bank. Galleries and restaurants on that side too. In ancient times the city had access to the sea. The Romans built a quay and Exeter became a busy port. At the end of the 1300's weirs were built downriver by the Countess of Devon to power her mills. Access was restored but her cousin the then 9th Earl of Devon built another weir so he could extract large tolls on the goods bound for Exeter that then had to be landed at his new quay at Topsham. This went on for the next 250 years until the latest petition to the king for the opening of the waterway succeeded. Bit late by then as the river had silted up. John Trew was asked by the city's traders to construct a canal to go round the weirs and rejoin the river in Exeter. He did and the work was completed in 1567. This was of the earliest of canals in Britain and was at least 200 years ahead of its time. Was not efficient however and a great deal more work was carried out until 1677 when the canal became very successful. Declined later with the coming of the railway. Its current use is for leisure and the quayside and the canal are being redeveloped. © Copyright M Etherington and licensed for reuse under this Creative Commons Licence. A visit with a difference! Unique! Take the youngsters. 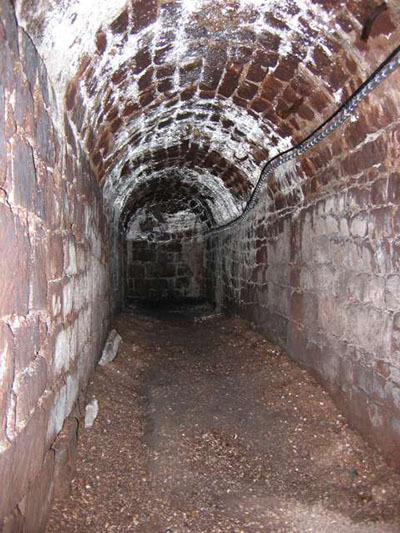 These vaulted passages run under the High Street. In medieval times these passages had lead pipes running through them to bring fresh water to the city from the springs in the fields beyond the city wall. Very useful thing to do when sieges were possible. The pipes were installed in the passages so that the pipes could be repaired with as little disruption as possible. Useful once again in troubled times. The entrance to the Underground Passages is in Paris Street and is a shop front access! The castle as we see it today was started in 1325, although its history goes back to the Norman Conquest. 2009 was the fiftieth anniversary of the Castle being open to the public. A very large and interesting building it is situated next to the Exe estuary in extensive deer parkland. The current owner Is the 18th Earl of Devon and Powderham has been in the family for all of its history. They were the family that closed the River Exe with weirs in the 1300's. The family went through all the difficulties of a prominent family during the Wars of the Roses and the subsequent Tudor times. During the Civil War they were Royalists and the Castle went through two sieges. With more settled times the Castle was extended and improved. Guided tours are available. A delight is the thirty five minute tractor trailer ride through the deer park. depending on the weather. Opportunities for snapshots. Wheelchair access only on the ground floor of the house and in the Secret Garden. Careful of the steep slopes though. Licensed Tea Rooms – for lunch or a delicious cream tea. Gift shop. Locally known as Haldon for its location. Certainly gives it a view right over to Dartmoor. Must be one if the loveliest racecourses in the country. The city may well have had a Celtic origin, but once again it could be older than that with its position on the River Exe and not far from the Estuary. The Romans appreciated its position and built a walled city around 50AD. It is possible to walk the route of the wall, although this one may be that built by Alfred The Great to keep out the Vikings. The city was captured by the Danes in 876, but King Alfred drove them out. They came again in 1001. The Saxons had battles with the Celts for Wessex for many years and this city was no exception. Althelston forced them out in 927. William The Conqueror was next on the scene. The city was against him, he lay seige and won. The deal was that the nobles could remain as they were but they must build a castle. Baldwin de Redvers rebelled against King Stephen, seized Exeter and became a pirate. He was defeated and went to join the Empress Maud in France. When Maud returned to England in 1141 successful for a while, she made him Earl of Devon. Tudor and Stuart eras too brought their problems and successes. In 1537 the city was made a county corporate and in effect had its own local government. The city stood up to a seige that lasted a month during the Prayer Book Rebellion. Largely a rebellion by folk in Devon and Cornwall who did not want the new English Prayer Book. Livery Dole is a street in Exeter that dates from the 1590's when the Livery Dole Almshouses and a Chapel at Heavitree, a district of Exeter, were built. The buildings are still there. Exeter contributed ships to defeat the Spanish Armada. The Civil War saw the city change hands. It was for Parliament, but the city was situated in the Royalist sympathetic southwest. The Royalists captured Exeter in 1643 and they held it to the end of the war. It was one of the last cities to fall to Parliament. Charles I Queen, Henrietta Maria, gave birth to her youngest daughter, Henrietta Anne, later Duchess of Orleans, at Bedford Houses Exeter in 1644, just before she fled to France. The industrial Revolution left the city largely untouched. To start with its water power gave it an edge but steam power needed coal and there was none close enough. Because of this Exeter has been spared the Victorian spread of small streets of workers houses crowded together like many of the Industrial Revolution towns still have. It did however have an early canal and this improved the economy. The Blitz of the Second World War flattened the city as it did many others. 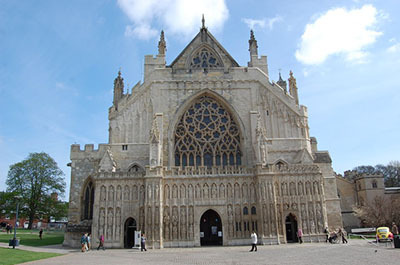 Exeter Cathedral was damaged and many of the other historic buildings were destroyed by fire through incendiary bombing. Preservation of old buildings was not attempted after the war and some have been lost. 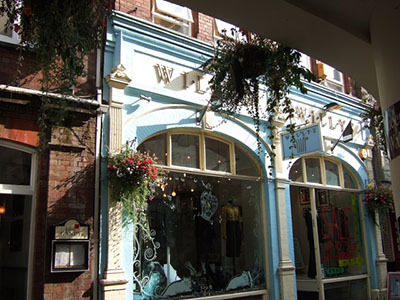 However Exeter does have a large number of listed buildings. Or you may wish ti browse some more, please do, you will find navigation buttons above on the left. Was built to withstand William the Conqueror. It has seen a lot of history since then!